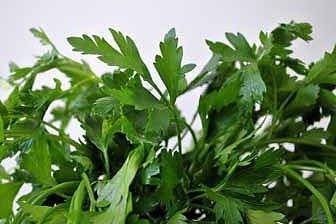 Parsley oil is high in a volatile oil called myristicin that has been shown in studies to enhance the activity of the glutathione-S-transferase enzyme. Glutathione-S-transferase helps protect our cells DNA from undergoing destructive changes that can lead to cancer. Garlic oil has a variety of compounds that may help prevent cancerous changes in our cells and many research studies have associated a lower risk of developing various cancers with regular consumption. Allyl sulfides found in garlic seem to inhibit cell growth in certain types of cancers such as skin cancer . One particular sulfide, known as diallyl sulfide, has also been shown to help prevent a toxic compound in burned meat called PhIP from turning into a damaging carcinogen. It should be noted that raw garlic, consumed daily, would be the most effective way to get its anti-cancer benefits. Many of us though aren’t prepared to live with that ‘garlic breath’ effect. As a compromise, a good garlic and parsley oil supplement may help protect your body’s cells against potentially cancer causing changes, without the pungent smell on your breath. There are many parsley health benefits for cardiovascular health, including its high levels of antioxidants, protective folate and anti-inflammatory falcarinol. Though parsley oil alone would not be a good source of these compounds, it does, however, contained the volatile oil myristicin, which may increase the activity of the body’s major detoxifier glutathione. Fresh parsley would have to be considered better for cardiovascular health. Dried organic parsley flakes can also be useful for adding to recipes when you can’t get the fresh stuff. Dried parsley also seems to help freshen the breath and it has a gentler flavor so you can add it to more recipes without it overpowering them. Garlic oil has been heavily studied for its cardiovascular benefits, in particular its ability to lower blood cholesterol and triglyceride levels and protect blood vessels and blood cells from oxidative damage and inflammation. The alliin in garlic is also known to help lower blood pressure by preventing potentially damaging contractions in our blood vessels. Much more on garlic coming up when I cover this amazing superfood in detail. Garlic and parsley oil are natural blood cleansers and detoxifiers that can benefit our liver and kidneys. The combination is also said to aid digestion, help treat skin diseases like acne and eczema and promote healthy skin in general. Many garlic and parsley oil preparations come in a base of soybean oil, which many people, myself included, would prefer to avoid. These garlic and parsley oil softgels however are soybean free and high strength at a low price. Ideally though, get the health benefits of parsley and the powerful protective effects of garlic when they’re fresh, perhaps saving supplements as a helpful backup support.